THAT Rhett Bastid.... the comic! ....then again.... not much really pleases the guy anyways, except "smash"-ing. So, ya know what?... jog on, Hulkster its nothing I can't fix when I'm not sick. What I don't want is the HUGE block of orangy/red blah on the door, but the wierd little "water spot" of violet is actually intriguing. 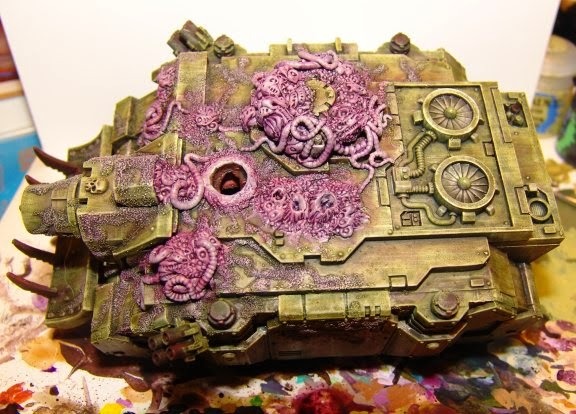 The sand texture underneath is meant to be sort of organic, so the plan is to break some of the red/orange with some of the purple/fleshy/pinks of the upper hull gribblies once I paint them. I'll break the rest up with some sponged black/brown. Most of the rest of the hull aft of the door is pretty good and with a little detailing here and there will be done. 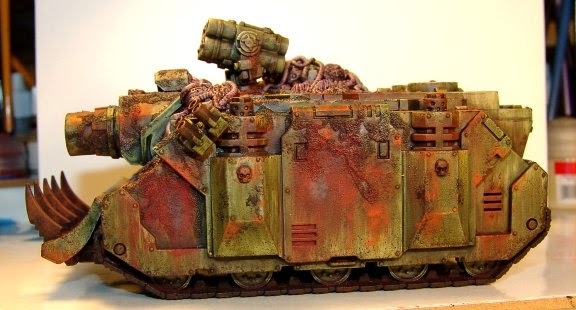 Compared to the Rhino, which is where the Vindicator was before I got "wild with the powder" while on cold meds. The other victim of "Man, that's just a big Spa-LATCH of flat color!" was the plow blade. Partly due to a poorly executed application of Alcohol and finished off by the dullcoat spray fixative. Again, a few interesting areas, but largely a redo or re-detail. Here's a look at both sides, so you can see all the nits I'll be picking at for my next or a future post, because I may have to step off this model for a bit and build something to "clean my eyeballs". I know, I know! 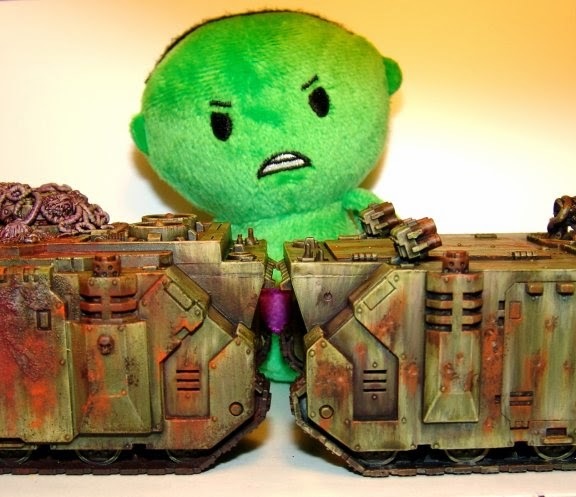 I could be a bit less of a crazy person over these things, but in all honesty, my dear friends, I've come to the painful realization of late that I am no longer a Warhammer 40k gamer. I .... am a hobbyist. 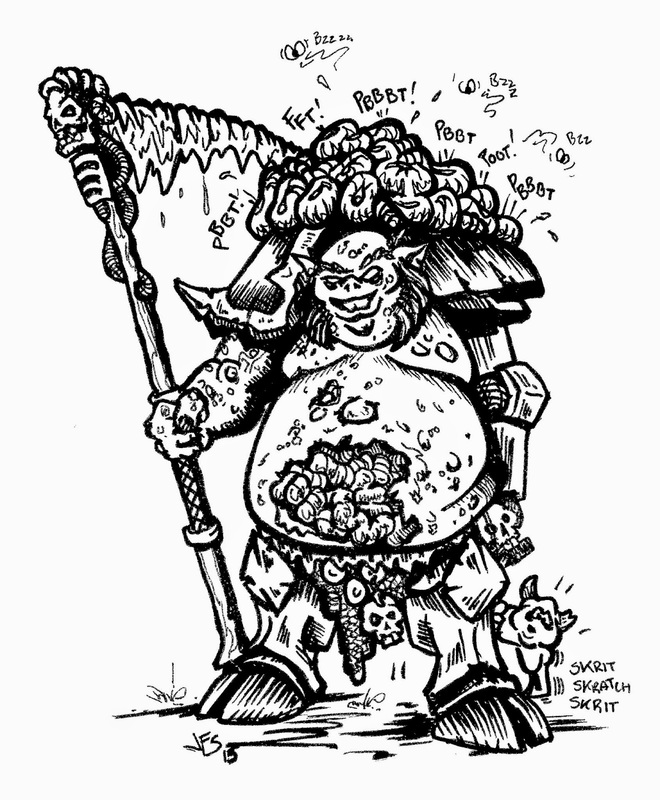 I have yet to play a game of 7th edition (partly due to scheduling and partly due to being stood up when I do find an opponent via my LGS websites). I'm not quitting. I have a TON of unbuilt models and my wife said she'd kill me if I sold them for what they would fetch on the market these days. So....I must build them. I must build them all. And have fun doing it. Just a side note, I'm going to get my art blog back up and running which means comics one of which will be about the Templars of DOOooom. No actual launch date yet, because I don't want to jinx myself, but the plan is instead of posting as I draw them this time and being horribly sporadic, to get a few a head and post monthly or bi-weekly so ya'll can get a chuckle and follow the storylines. Personally, I like April Fool's day as a goal, but then no one will believe I'm actually going to do it if I say I'm going to do it. ...who am I kidding, I needed about 4 more days. 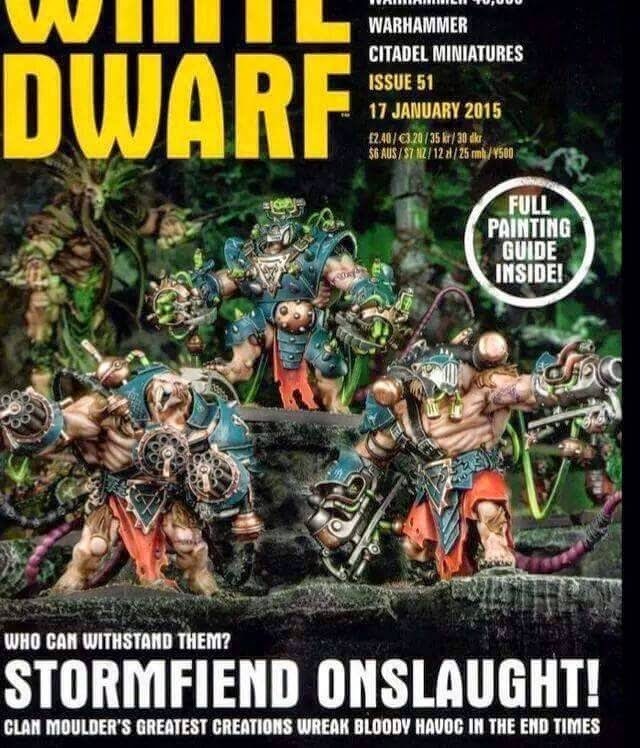 Abject failure for the Call of Chaos VII painting challenge. Well, at least when it comes to the dead line. 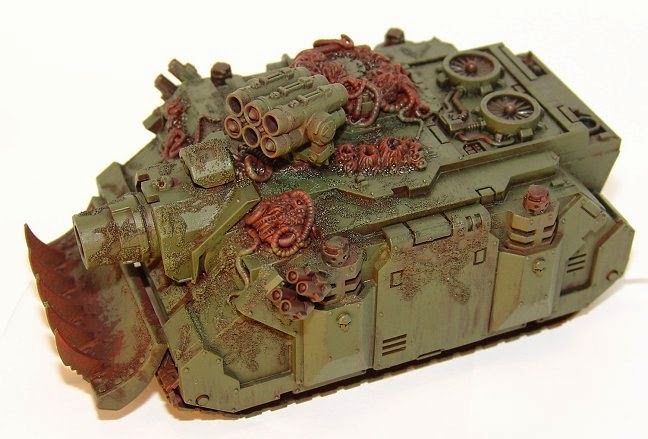 As for the Vindicator, I started the gribblies and nasty deamonic infected parts. Here they are primed and washed in purple,crimson and some green. I worked on the Rhino while waiting for washes to dry. Here's a great shot that shows the difference in the two post and pre-washes..
Somewhere along the way, working around all this Nurgly stuff brought me the "blessing" of a flu-like evil thing (or, more likely, the wife carried it home from those little plaguebearers she teaches at school) The time I've lost (so far) I probably could have finished both vehicles before the deadline... but here they stand. Close, but not totally finished. Still lots of detailing,weathering and tentacly gribblies to finish on both of them. 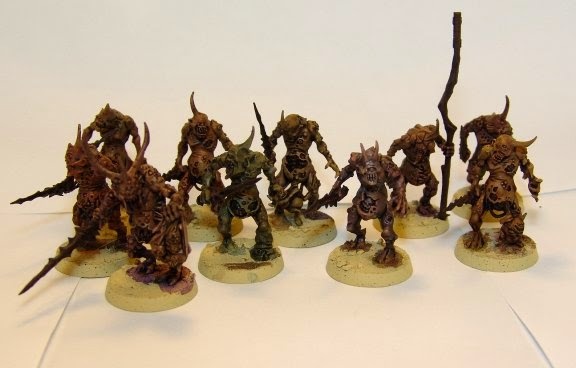 The 10 Plaguebearers are at Stage 2 , they still need highlighting and detailing. One of these days, I'll do a painting challenge and remember how terribly slow I paint. But, I'll be finishing these projects up. The vehicles are definitely priority 1. 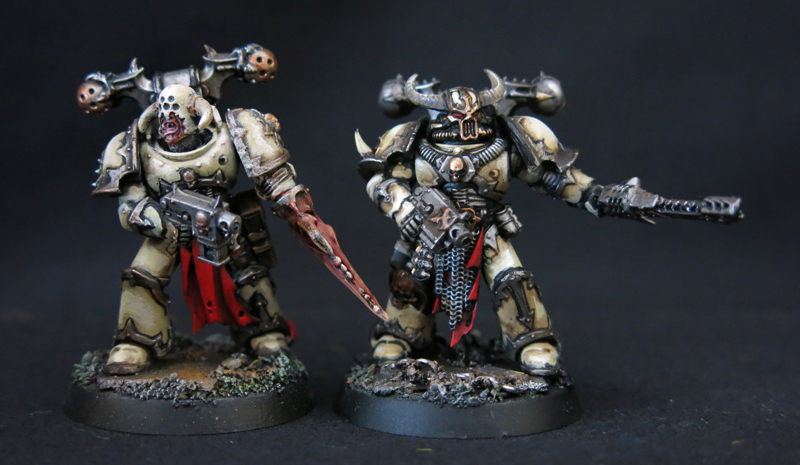 The Plaguebearers will likely be the side project I work on while I'm waiting for greenstuff or paint to dry. That's all for now. 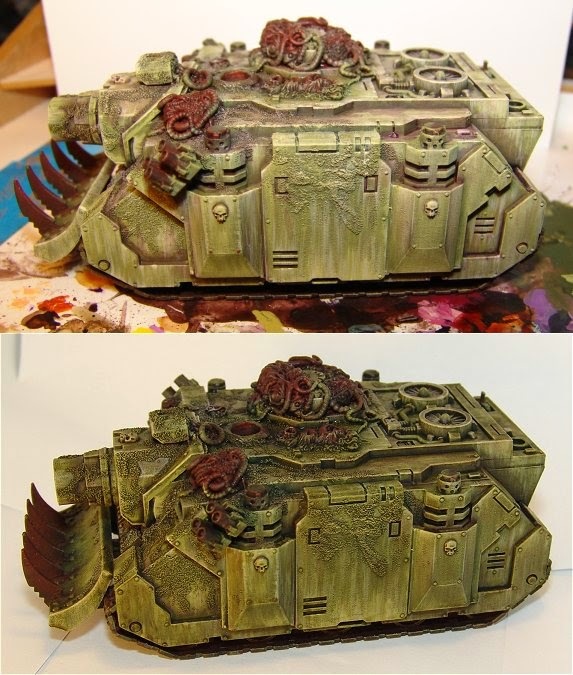 The top is the completed treatment from the last post, with some shading (Druchii Purple Wash) Then, a couple washes - one overall, one to darken areas with the same downward stroke technique- of good ol' Althonian Camoshade and BAM.... greens are done. 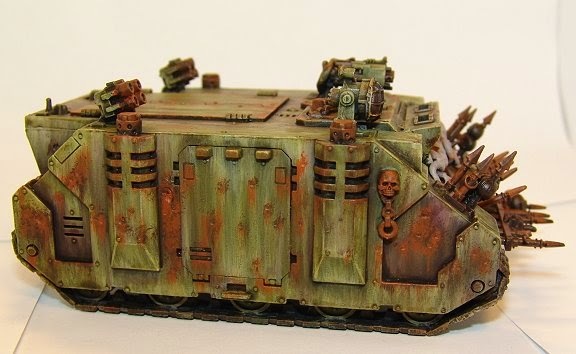 Not on to the organic bits and the rusting/weathering. I still have a Rhino and some Plaguebearers to finish by Thursday. Lots of painting the next two days. I'm kind of going into the old college all- nighter mode. And frankly, I'm kind of loving it...aside from my wife's vehicle deciding to break in the middle of it all. Well, that's it for now. 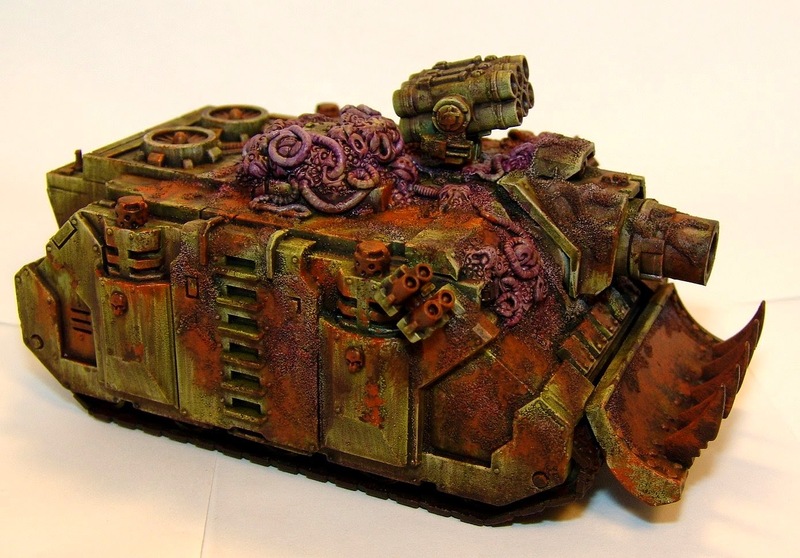 I'll have another post later in the week - no matter what level of success, on the Call of Chaos painting challenge group. Yeeeeaaaaah <wrings hands> those guys would be perrrrrrfect! 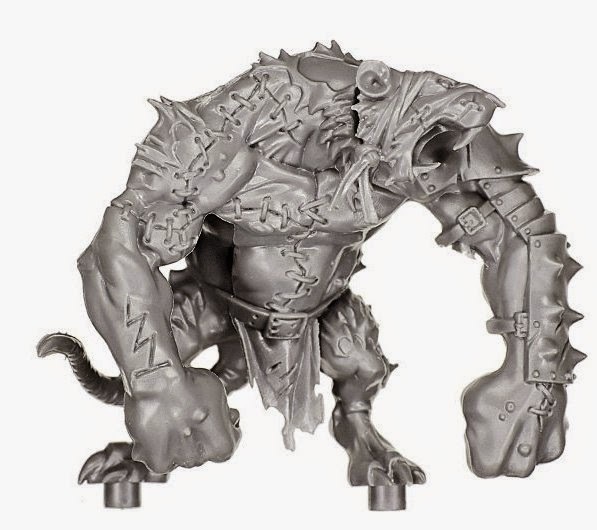 I think they will make a great base for the conversion into weapon beasts. 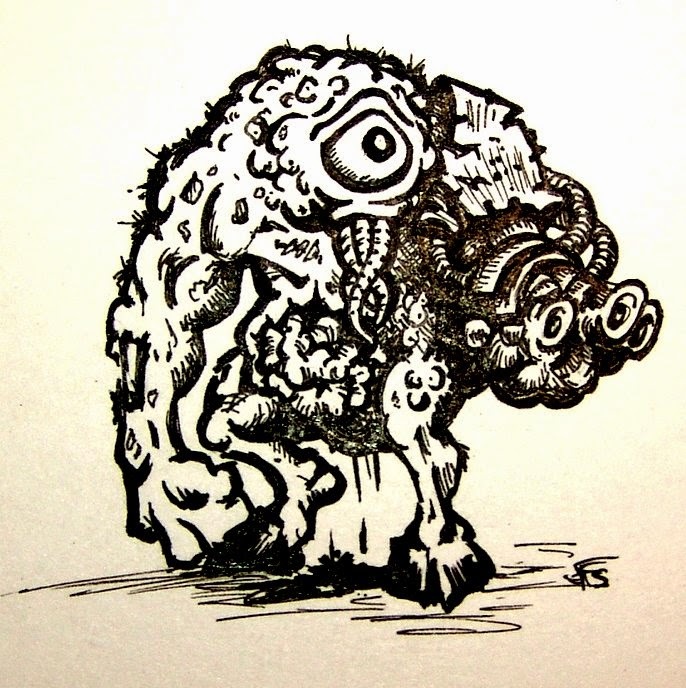 There's a better chance of a head with a big eye (think Blinky) rather than rat heads. OH the things I can do. AND I have 4 more from the Blood Isle sprues. 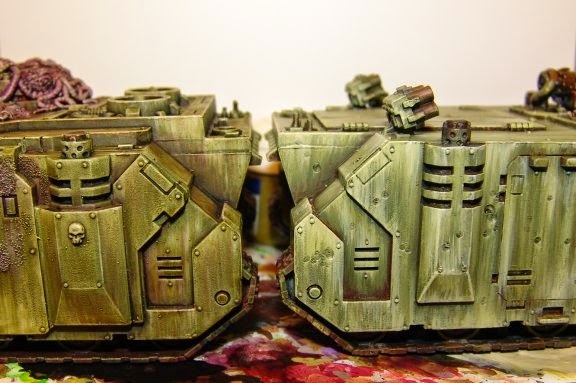 More progress on the tanks with a painting session planned for tonight and tomorrow. I'll post some pics Sunday night. The Rhino and the Vindicator "primed". 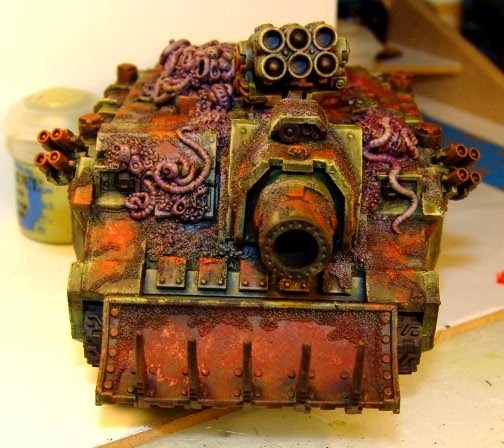 Really, primed red brown, then washed with a brown/black. 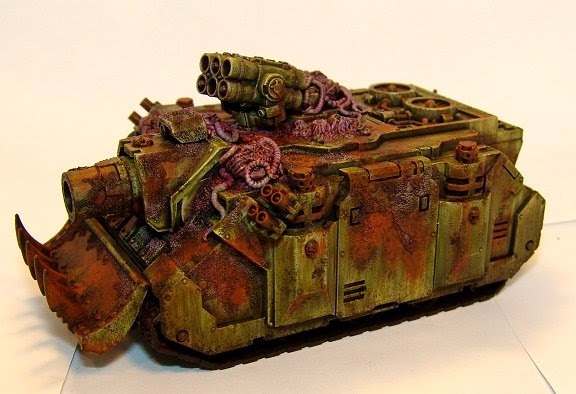 In the Rhino's case I had started painting it a couple years back and didn't like the paint scheme so I gave it a wash with the brown/black as well. The next step was beginning the layers of greens that would make up the hull color. First, GW Castellan Green. I used a #6 Flat brush for pretty much everything, usually applying the paint in downward strokes or even thinned dabs. 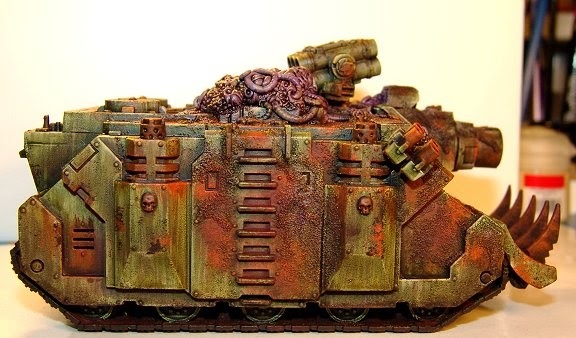 The big thing was getting coverage, but letting some of the brown tones show through in certain places and also for a bit of that war-weary look. 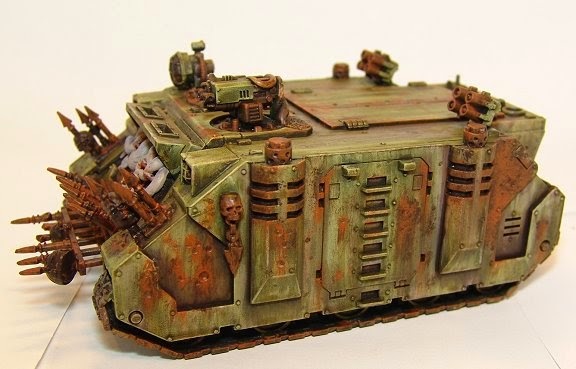 The sad part is, in the long run a good deal of the greens I'm agonizing over will be covered with corruption, rust or weathering. The next step was highlight layers. 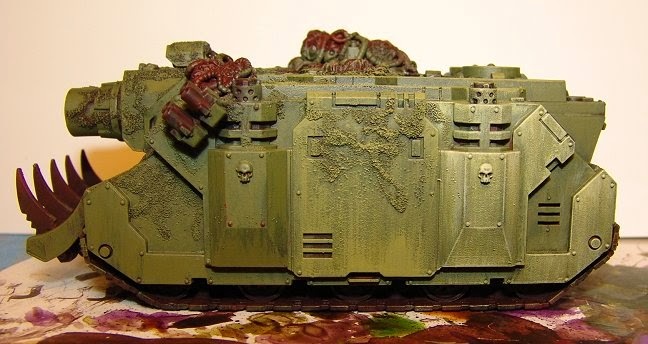 GW Death World Forest was the first layer in an overall run to bring out edges and add character to the green. 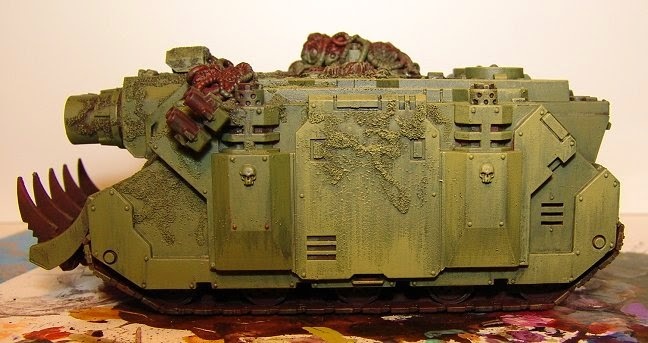 From the side door back you can see the 3rd color, GW Gretchin Green. You can also see the streaky brush application I was talking about. The 4th step is even more highlights withe GW Ogryn Camo and Bleached Bone. You can see my steps #2- #4 in the next photo.